She spent three weeks in the hospital after breaking her hip in a fall from her bed on July 17. She has been frail and "pretty much confined to a wheelchair" since a 2002 car accident, said Von Anhalt. The crash happened when the car in which she was riding with her hairdresser slammed into a light pole on Sunset Boulevard in Los Angeles. The glamorous Hungarian-born actress, the second of the three celebrated Gabor sisters, is most famous for her many marriages. Among her husbands was Oscar-winning actor George Sanders. - CNN's Jack Hannah contributed to this report. 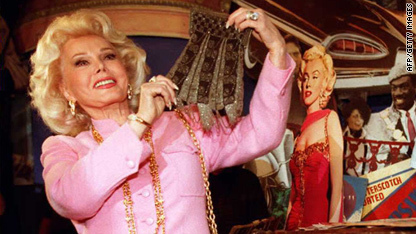 It's sad to see someone who was so vibrant and beautiful as Ms. Gabor fading away. Unfortunately this is what it comes to when you reach your 90's. She will continue to fail and eventually a visit to the hospital will be her last. She gave much enjoyment to people in my mother and grandmother's generation and is well known no matter which generation you come from. I wish her and her husband peace in the final chapter of their lives. God Bless them both. It strikes me as odd the way being cool has changed. Once was the time, you were more cool the more you knew things. Now it's chic to be an ignoramus. Yeah, that just reeks of cool swagger. So cool you get to judge who is and is not worth remembering. Trust me, kid. You ain't all that, and the people you impress with that posture will grow up and leave you behind.